Sediments transported and deposited during the Pleistocene glaciations are abundant throughout Canada. They are important sources of construction materials and are valuable as reservoirs for groundwater. Because they are almost all unconsolidated, they have significant implications for mass wasting. Figure 16.29 illustrates some of the ways that sediments are transported and deposited. 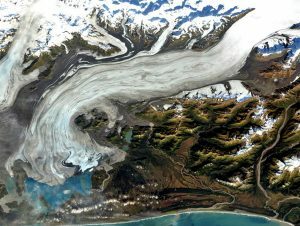 The Bering Glacier is the largest in North America, and although most of it is in Alaska, it flows from an icefield that extends into southwestern Yukon. The surface of the ice is partially, or in some cases completely, covered with rocky debris that has fallen from surrounding steep rock faces. 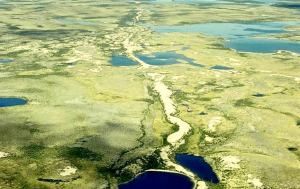 There are muddy rivers issuing from the glacier in several locations, depositing sediment on land, into Vitus Lake, and directly into the ocean. There are dirty icebergs shedding their sediment into the lake. And, not visible in this view, there are sediments being moved along beneath the ice. The formation and movement of sediments in glacial environments is shown diagrammatically in Figure 16.30. There are many types of glacial sediment generally classified by whether they are transported on, within, or beneath the glacial ice. The main types of sediment in a glacial environment are described below. 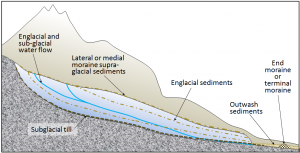 Supraglacial (on top of the ice) and englacial (within the ice) sediments that slide off the melting front of a stationary glacier can form a ridge of unsorted sediments called an end moraine. The end moraine that represents the farthest advance of the glacier is a terminal moraine. Sediments transported and deposited by glacial ice are known as till. Subglacial sediment (e.g., lodgement till) is material that has been eroded from the underlying rock by the ice, and is moved by the ice. It has a wide range of grain sizes, including a relatively high proportion of silt and clay. The larger clasts (pebbles to boulders in size) tend to become partly rounded by abrasion. When a glacier eventually melts, the lodgement till is exposed as a sheet of well-compacted sediment ranging from several centimetres to many metres in thickness. Lodgement till is normally unbedded. An example is shown in Figure 16.31a. Supraglacial sediments are primarily derived from freeze-thaw eroded material that has fallen onto the ice from rocky slopes above. These sediments form lateral moraines (Figure 16.1) and, where two glaciers meet, medial moraines. (Medial moraines are visible on the Aletsch Glacier in Figure 16.22.) Most of this material is deposited on the ground when the ice melts, and is therefore called ablation till, a mixture of fine and coarse angular rock fragments, with much less sand, silt, and clay than lodgement till. An example is shown in Figure 16.31b. 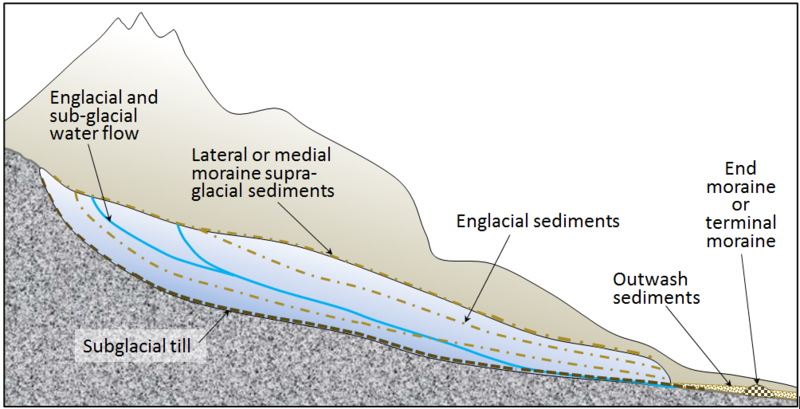 When supraglacial sediments become incorporated into the body of the glacier, they are known as englacial sediments (Figure 16.30). Massive amounts of water flow on the surface, within, and at the base of a glacier, even in cold areas and even when the glacier is advancing. Depending on its velocity, this water is able to move sediments of various sizes and most of that material is washed out of the lower end of the glacier and deposited as outwash sediments. These sediments accumulate in a wide range of environments in the proglacial region (the area in front of a glacier), most in fluvial environments, but some in lakes and the ocean. Glaciofluvial sediments are similar to sediments deposited in normal fluvial environments, and are dominated by silt, sand, and gravel. The grains tend to be moderately well rounded, and the sediments have similar sedimentary structures (e.g., bedding, cross-bedding, clast imbrication) to those formed by non-glacial streams (Figure 16.32a and 16.32b). Figure 16.32 Examples of glaciofluvial sediments: a: glaciofluvial sand of the Quadra Sand Formation at Comox, B.C. ; b: glaciofluvial gravel and sand, Nanaimo, B.C. A large proglacial plain of sediment is called a sandur (a.k.a. an outwash plain), and within that area, glaciofluvial deposits can be tens of metres thick. In situations where a glacier is receding, a block of ice might become separated from the main ice sheet and become buried in glaciofluvial sediments. When the ice block eventually melts, a depression forms, known as a kettle, and if this fills with water, it is known as a kettle lake (Figure 16.33). A subglacial stream will create its own channel within the ice, and sediments that are being transported and deposited by the stream will build up within that channel. When the ice recedes, the sediment will remain to form a long sinuous ridge known as an esker. Eskers are most common in areas of continental glaciation. They can be several metres high, tens of metres wide, and tens of kilometres long (Figure 16.34). Outwash streams commonly flow into proglacial lakes where glaciolacustrine sediments are deposited. These are dominated by silt- and clay-sized particles and are typically laminated on the millimetre scale. In some cases, varves develop; varves are series of beds with distinctive summer and winter layers: relatively coarse in the summer when melt discharge is high, and finer in the winter, when discharge is very low. Icebergs are common on proglacial lakes, and most of them contain englacial sediments of various sizes. As the bergs melt, the released clasts sink to the bottom and are incorporated into the glaciolacustrine layers as drop stones (Figure 6.35a). The processes that occur in proglacial lakes can also take place where a glacier terminates in the ocean. The sediments deposited there are called glaciomarine sediments (Figure 6.35b). This photo shows the Bering Glacier in Alaska (same as Figure 16.29). Glacial sediments of many different types are being deposited throughout this area. Identify where you would expect to fine the following: (a) glaciofluvial sand, (b) lodgement till, (c) glaciolacustrine clay with drop stones, (d) ablation till, and (e) glaciomarine silt and clay. 16.4 Glacial Deposition by Steven Earle is licensed under a Creative Commons Attribution 4.0 International License, except where otherwise noted.